Each year, losing weight and exercising more are among the top goals on new year’s resolution lists. Fitness chains across the country profit from this trend annually, signing up droves of people who’ve decided to begin the year by getting into shape. But many new gym patrons cancel their membership before spring comes, and almost half don’t make it beyond the first month. By some estimates, more than 12 percent of Americans join gyms in January, higher than the 8 percent on average who join during the rest of the year. Once October rolls around, just 22 percent of the members who joined a gym at the start of the year remain active, according to the data intelligence firm Cardlytics. These numbers don’t necessarily mean the United States is a nation of quitters, but that it can be challenging to make the time to go to the gym, to know what to do once you get there, and to maintain the practice. For others, an arbitrary calendar date isn’t inspiration enough to get people into a gym regularly. Instead, they get fit when they’re personally motivated to do so, which may be why some health clubs report that as many new members join in March as they do in January. And gym memberships keep growing. In 2010, roughly 50 million people belonged to a fitness center. In 2017, that number grew to 70.2 million Americans, according to the International Health, Racquet, and Sportsclub Association. As the number of Americans joining health clubs grows every year, gyms are striving to make January a month where they can retain newcomers for the long haul. On New Year’s Day, an occasion when most companies are closed, gyms stay open due to the onslaught of new customers who kick off fitness regimens at the start of each new year. Chains like Planet Fitness do this, in part, by charging a $10 monthly fee, while Gold’s Gym offers free membership trial passes. Crunch prides itself on its personalized training for members. And nearly all gyms, including LA Fitness, offer sign-up specials in January. A number hire new staff to meet the demands of the new customers. But a time that so often results in a financial windfall for gyms also sees scores of recruits come and go. To retain the new patrons, gyms often combine financial incentives with emotional ones. That means promoting themselves as inclusive and nonjudgmental — customers who miss several workouts aren’t scolded when they return — while offering deals, fitness and nutrition guidance, and commitment-free memberships to gym-goers. Planet Fitness, which has more than 1,500 locations nationally, keeps it simple when it comes to retaining the January gym-goers. Gosselin did not disclose any figures related to new members and retention at Planet Fitness but said that the company gets patrons year-round by setting achievable goals and celebrating small successes for them. Moreover, Planet Fitness has cultivated an image of itself as the everyman or everywoman’s gym, with commercials showing people with average physiques and that make fun of stereotypical gym rats. With the hashtag #NoJudgments as its slogan, Crunch also bills itself as a gym for ordinary people. It promotes itself as a place where positivity, inclusion, and fun are valued. The gym is now trying to recruit new members to its facilities by offering 30 percent off dues through January 13. But Adam Toma, the general manager of Crunch in Burbank, California, said that joining the gym in December, when deals are also offered, can help newcomers save money. The personal training Crunch offers helps the gym retain newcomers. 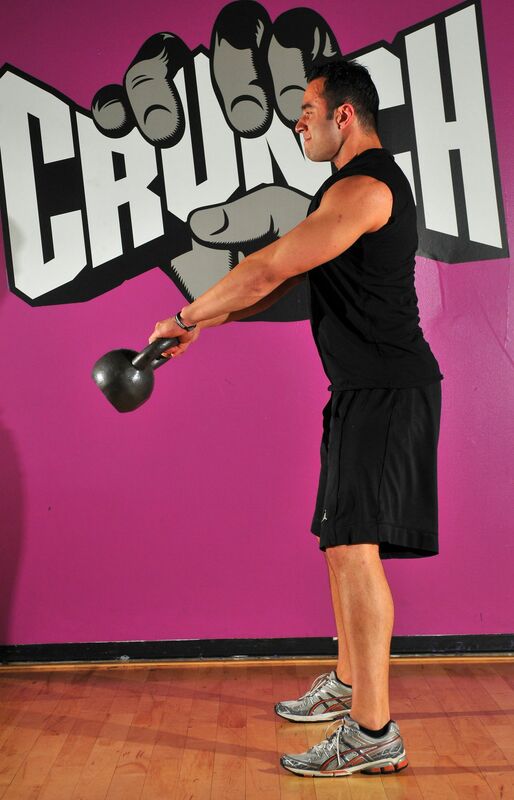 A man using a kettlebell at Crunch gym. Personal training may also lead members to feel like they have someone to hold them accountable or support them as they meet their goals. The training, however, comes at an additional cost, Toma explained. Planet Fitness offers free fitness classes and instruction that help members stay motivated. Through January 15, the gym is allowing people to join with $1 down. They can cancel at any time, a policy that Crunch also has. While new gym members typically drop off at all health clubs after the first months of the year, Toma says he sees a resurgence in clients by early summer. By the end of the year, however, people begin to check in less and less due to the holidays, he said. Like Gosselin, he did not disclose actual figures related to membership. But just as the rush of Black Friday and decadent holiday meals wears off, suddenly it’s the new year. And the cycle of joining a gym just to ghost on fitness for a while repeats itself.